Nirya is an Altmer sorceress and a scholar at the College of Winterhold. She does not offer any training to you nor does she offer any kind of merchant services. She is not on good terms with Faralda. Nirya will spend the morning in the Hall of Countenance and her afternoons in the Hall of the Elements before heading off to bed at around 10pm. She wears expert robes of Destruction and a pair of boots. Nirya may greet you with, "It's a small group of us here at the College. Favors don't go unremembered. Neither do affronts. ", "If you're working on any experiments, please clean up after yourself. ", "Just like anywhere else, it's all about who you know. Lucky for you, you know me. ", or "I think the College is due for a change in leadership." Should you become Arch-Mage, however, her tone will change as she will quite obviously try to win your favor by saying things like, "May I just say, it's a pleasure to have you leading the College. Really. ", "I'm sure you've made note of who's been the most helpful during your time here, Arch-Mage. ", "If there's ever any way I can assist you, please let me know. ", and "Ancano is exactly why we're so restrictive about access to the College. We'd all have perished if it weren't for you." When first spoken to, Nirya will vaguely comment, "It's lies. All of it. I don't care what she told you, it's all lies." If you ask who she is taking about, she will answer, "Faralda. Don't act like she didn't say anything. I know her, I know what she's been up to." If you instead say you have no idea what she's talking about, she will warn you, "No? Well, then she hasn't gotten to you yet. But she will. And you don't you believe a word of it." You may ask her about her problem with Faralda, which Nirya will vehemently deny: "My problem with her? She's the one who has a problem with me! She's threatened by me! By my skill as a wizard, by my elegance and posture, by my superior good looks! But she's not going to get the better of me, oh no. I won't let it get to me one bit. That's what she's after." Like most members of the College, Nirya will express suspicion of Ancano, Arch-Mage Aren's advisor: "Don't trust that one. He's up to something. Most here are up to something, of course, but in his case, it's not good. I haven't figured it out yet, but I will." along with an admiring comment: "He is rather handsome though, isn't he?" Asking if she has ever heard of the Augur of Dunlain will yield an unhelpful response from her: "It's not enough that you've stolen the spotlight with this Eye thing, now you're looking for the Augur? I'm not sure what you're playing at, but you'd do well to remember your place around here." As you complete more quests for the College, Ancano will eventually unleash disaster on Winterhold when he takes control of the Eye of Magnus, proving Nirya's suspicions. During this, she will ask you, "What's going on?!" When you set out to retrieve the Staff of Magnus, she will remark, "We never should have pulled that thing out of Saarthal." During The Eye of Magnus, she can be found saying, "Why doesn't someone do something?" During The Black Star, asking if there is an elven mage in the College that studies stars will make her suspicious: "Did you say an 'elf' and 'stars'? I hope you don't know what you're asking." Further inquiring about what happened will have her explain, "There was an... unfortunate incident a few years ago. An elven mage named Nelacar was exiled from the College over it." and interestingly comment, "He's still in town, getting by plying spells to the people inside the Frozen Hearth. Disgraceful." If you instead state that you were given a vision, she will reply with, "You were given a vision? Are you serious? Whatever. The person you probably want is Nelacar. He's in the Frozen Hearth. Be careful, he was exiled from the College for a reason." Nirya is much shorter than other Altmer. Upon using console commands to force marriage, a quest is revealed in which you are asked to retrieve some papers of Faralda's. The papers are not present in-game but an option to say "I have the papers." is available. You will gain 100 gold each time you choose this, and the option remains indefinitely. It seems this quest was cut as a result of a spelling mistake, and probably removed the chance of gaining Nirya's favor to allow you to marry her without using the console. According to the unused quest stages of First Lessons, Nirya was supposed to be guarding the entrance to the College of Winterhold, and thus play a part in entering the College when you are required to cast Healing Hands at her. She even has unused dialogue that indicates her part as the gatekeeper. This never happens in game, however, leading to a bug under certain circumstances as noted below. When asked about Ancano, her voice will change and be completely different. 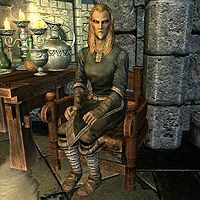 If you gain entrance to the College by telling Faralda you are the Dragonborn and showing her your Thu'um, the miscellaneous quest to Visit the College of Winterhold will remain incomplete in your log and will point at Nirya indefinitely. At times, she will completely ignore her schedule and instead follow you whenever you are in a close range to her, but not at a distance. When you are farther away, she will remain in the area she stopped at indefinitely. Typing setstage mgmainquestbridge 200 into the console will fix it. This page was last modified on 10 April 2018, at 05:56.